Bring your bike helmets, your mileage trackers and your sense of adventure. St. Louis is the right place to exercise your active lifestyle in 2018. This trail-lover’s hot spot is perfect whether you’re rolling along the river or walking on downtown trails and in beautiful parks during your Gateway City getaway. If you’re looking for a combination of exercise and urban adventure, start at the newly redesigned Gateway Arch grounds and Riverfront Trail along the Mississippi River. Natural landscaping enhances walking paths that surround the nation’s tallest national monument and roll beside the river called the Father of Waters. Reimagined for the Arch’s 50th birthday in 2015, the paths and landscaping are newly completed for this season. Didn’t bring your bike? No problem. Cruisers and road bikes are for rent at Urban Shark bicycle shop. Cycling routes are marked with Bike St. Louis signs on downtown streets, leading the way to historic neighborhoods and attractions. Special events that appeal to riders include the late night Moonlight Ramble in August where thousands of cycling fans take a leisurely ride through downtown and midtown streets all the way to beautiful Forest Park. Routes are designed to be perfect for beginners to experienced riders and everyone in between. For biking fans who want to watch the pros battle it out, a series of criterion-style riding events is staged over Labor Day weekend on the streets of St. Louis’ historic neighborhoods, including Lafayette Square and The Hill. Cyclists interested in joining up with planned group riding events can keep track of opportunities on trailnet.org. In Forest Park, bike tours through the massive green space are offered on a regular basis by City Cycling Tours. You’ll pedal past St. Louis’ top attractions including the art museum, science center and history museum. More than a hundred miles of greenways throughout the St. Louis area include highlights such as Grant’s Trail, a path that rolls past President Ulysses S. Grant’s home, White Haven. Outside of town in nearby St. Charles, the Katy Trail is a rails-to-trails conversion that cuts across the state from east to west. 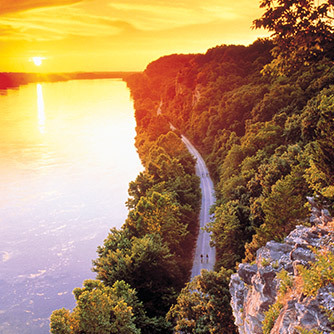 Bikers can plan a multi-day ride to the other side of Missouri, or just enjoy a pleasant outing between scenic wineries and small towns overlooking the Missouri River west of St. Louis on the flat, limestone trail. For those in search of more challenging dirt trail fun, the Chain of Rocks Mountain Bike Trail is open north of downtown. Beyond biking and walking, outdoor lovers can take to the water in St. Louis. Rent a paddleboat at the Boathouse in Forest Park for a jaunt through the park’s scenic lakes. Dog parents should watch for the annual Paddle With Your Pooch event that welcomes life-vested pups into the boats. Creve Coeur Lake welcomes canoes and kayaks to the calm waters. 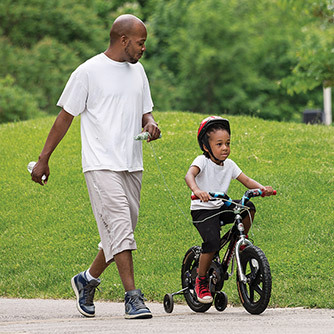 Walkers and bikers can enjoy the paths that ring the west St. Louis County lake. Longing to get even closer to the Mighty Mississippi or the Missouri river? Big Muddy Adventures is an outfitter that can get your group safely onto the area’s majestic waterways like a new-age Huck Finn. Look up! There are plenty of overhead adventures in St. Louis. Learn to fly with the help of professionally trained circus artists at TrapezeSTL, who will teach people ages 6 and older to swing through the air. Single swing classes or continuing lessons are available. A different kind of swinging is found at Adventure Valley Zipline and Go Ape! Zipline, where visitors are invited to zoom through the treetops securely in safety gear on multi-station zip lines high off the ground. Outdoor lovers can bond with nature at the Columbia Bottom Conservation Area or the Edward “Ted” and Pat Jones Confluence Point State Park with hiking, biking and bird watching opportunities at the confluence of the Mississippi and Missouri rivers. 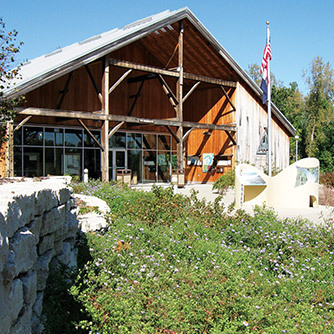 The Audubon Center at Riverlands provides world-class viewing opportunities for bird and wildlife enthusiasts. Hikers can walk among art in the rolling terrain at Laumeier Sculpture Park or visit the nature center at Powder Valley Conservation Center. When winter comes to St. Louis, Hidden Valley Ski Resort heats up as the place for skiing, snowboarding and tubing adventures fit for everyone’s skill level. Skating rinks take advantage of the colder weather at Shaw Park in Clayton and Steinberg Skating Rink in Forest Park. Seek adventure in the urban outdoors of St. Louis.